7BR include 2 Masters, 2 Large Suites/Dorms. 4BA. Sleeps 18-20. 10 Minutes to Mt Snow, Lake Raponda, Wilmington center, right near Adam's Farm/Sleigh Rides - tucked away on a peaceful, rural lot. Good for family reunions, work retreats. 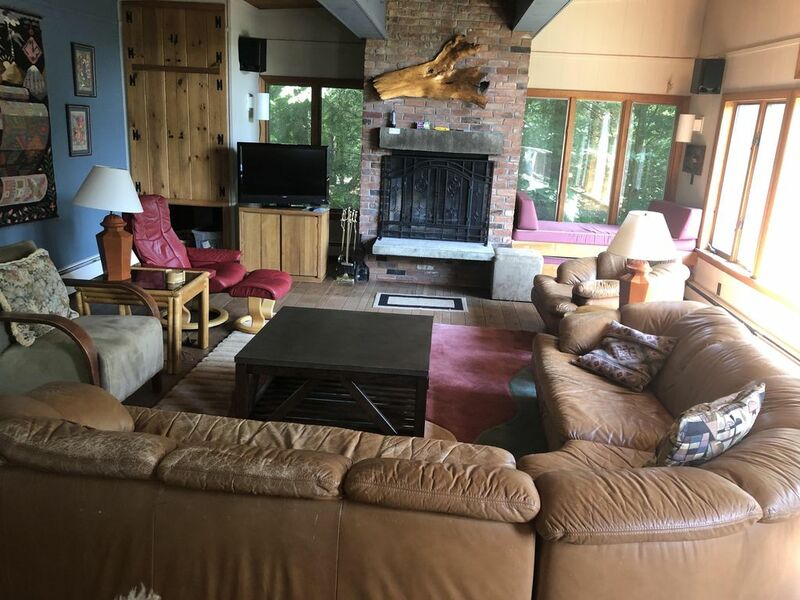 Large living room with comfy seating, fireplace, cathedral ceiling, large picture windows overlooking mountain and small pond. Fully equipped, newly renovated kitchen/dining room with fireplace. 'Like home' conveniences. 7 bedrooms - 2 Masters (one with fireplace, one opening out to deck), 2 Suites/Dorms, 3 regular bedrooms. Washer/dryer. Two-level back deck with hot-tub. Skate on the pond in winter, catch salamanders in spring and summer. Hiking and X-country skiing right out the door. Snow removal provided. Room for everyone to spread out, three fireplaces, outdoor hot tub on deck under the stars, recently renovated kitchen with brand new appliances. Has everything we need for a large group. We enjoyed our stay twice last year and once this year so far. We are looking forward to our March visit. We love staying at this house near Mount Snow. It's spacious, well equipped, and comfortable for large groups. Can't wait to be back next year! Enjoyed this place very much. 5 minutes to Mt. Snow. Cozy fireplace and Snow frosted Jacuzzi is just ahhh after a long day on the cold mountain. There's a gourmet market just down the road and plenty of room for everyone. Best of all - the upstairs bedroom is more like a loft that sleeps a bunch of kids. The little ones can have their own adventure of a sleepover while parents have time to themselves below. We stayed here with 12 people, and it was very comfortable. Everyone had their own room ( 5 couples and 2 singles) with plenty of space for so much more! The house was nicely laid out and we were all able to be together, while not being crammed. The hot tub was great and stayed nice and hot for us! We loved all the art around the house as well. The kitchen was fully stocked with everything we would need to cook a meal, which we did! The extra fridge was helpful as well! Bathrooms were all great! If I have anything constructive to say about the house, its that 2 of the bathrooms could use a facelift. But really, the house was great and we loved it. It was soo close to the mountain and there is even a general store at the end of the block. The mud room was huge and wonderful! Having a garage was a total plus! We expect to be back next year!! Thanks!! This home is amazing. Photos do not do it justice. We stayed, 18 of us, for a long weekend. There was so much space, a large living room to fit us all. Kitchen/dining area is also perfect for a large group. So many places to sleep, everyone had a bed. The house had everything you needed and was clean. Most rooms were very quiet (two babies slept while adults played games and shouted and they did not wake up!) Yard is also lovely. Owners were so easy and amazing to deal with!!! We are excited to rent again next year. 5 Families stayed in this home and we all loved it! The house was clean, spacious and very well equipped. It was only a 7 minute drive to Mount Snow for the most amazing skiing and snow boarding around! Hope we can get this house again next year! WINTER - Snowboard, ski downhill and cross country, or sled by day and dance to live music by night. Wine and dine at Wilmington's finest, or order in Pizza, Chinese, or Chicken & Ribs for the gang. Huddle under the blankets of a horse drawn sleigh ride, or practice your figure eights at one of the local lakes or backyard pond. AUTUMN - Indulge in the splendor of the spectacular fall foliage, hike the hills, go antiquing, and celebrate Thanksgiving in the peace & quiet. SUMMER - Take a swim or canoe ride at the lake, charge the mountain on your bike, visit the petting farm with the kids, splurge at the outdoor flea market, and enjoy the arts & music festivals. Whatever Season... Relax, Enjoy, Celebrate Year Round!